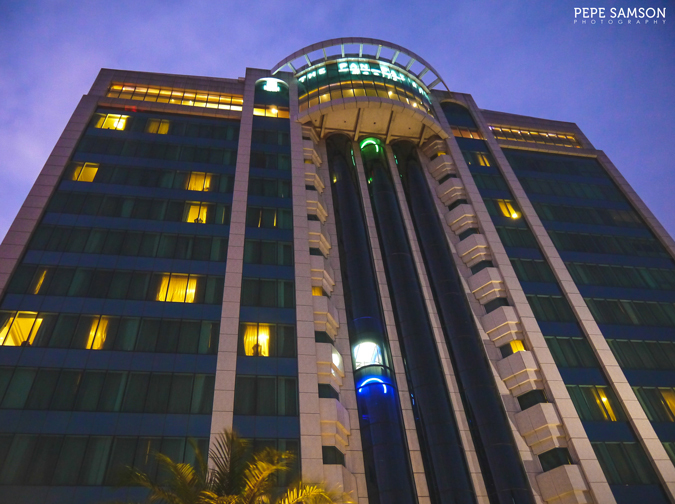 Pan Pacific Manila is known as the “Number 1 Hotel in Manila”. 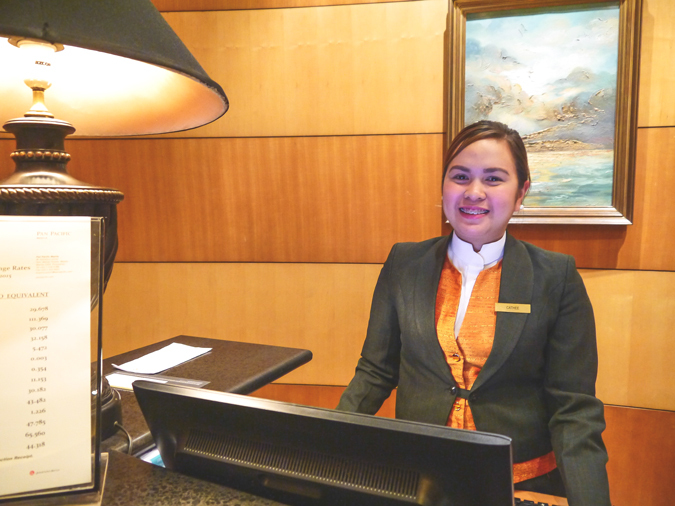 The 236-room luxury property, which plays host to business moguls and government officials from Asia, is a top choice among business and luxury travelers—a status well-deserved with its reputation for being the finest butler hotel in Manila. 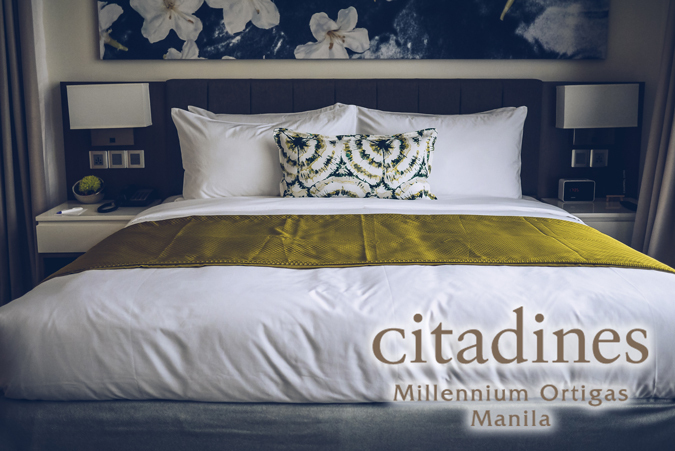 Located centrally in Malate, the five-star hotel sits near corporate hubs, convention centers, dining spots, and entertainment centers—making it ideal for business and leisure alike. 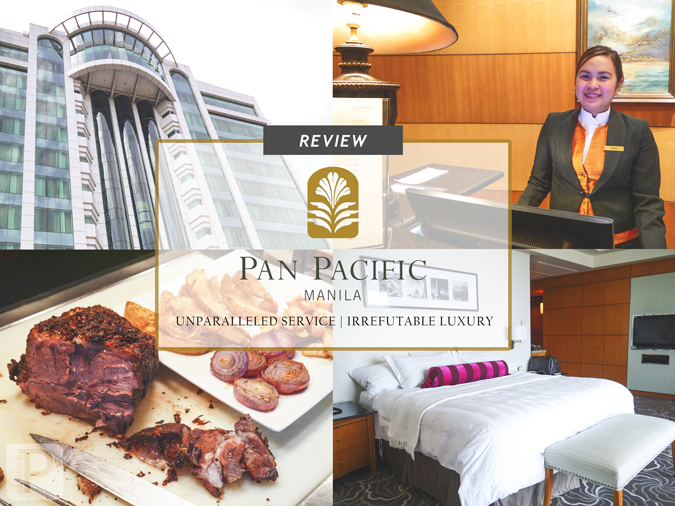 But more than being a modern marvel planted amidst the cultural wonders of the capital, Pan Pacific Manila prides itself for its top-notch service, which is the primary reason why it remains to be the only choice of returning long-staying guests and loyal patrons. 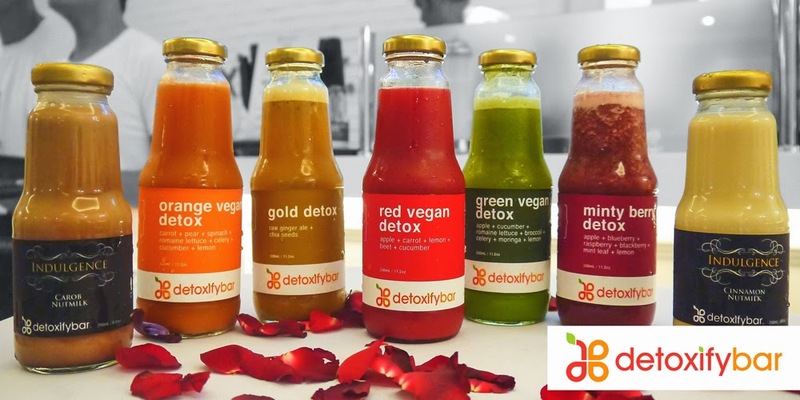 You have to be there to truly tell what it’s like, and lucky me, I was able to experience it through an overnight stay at this awesome hotel. 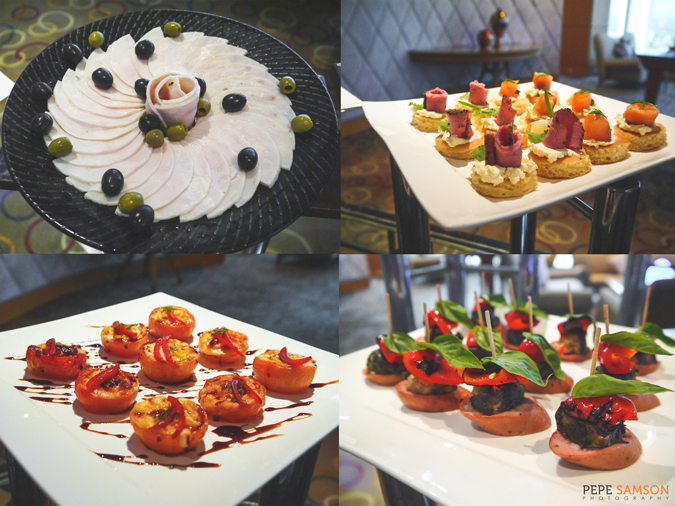 The rooms were recently renovated, part of a huge project aimed at keeping the hotel facilities up-to-date. 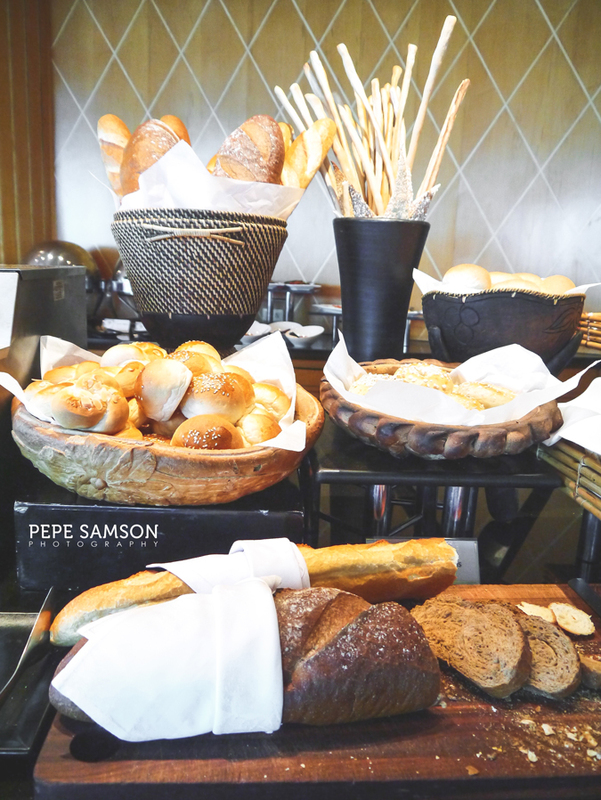 For any hotel catering to such a demanding, sophisticated clientele, continuous innovation over the years is important—and of course, Manila’s Number 1 won’t be the last to do it. 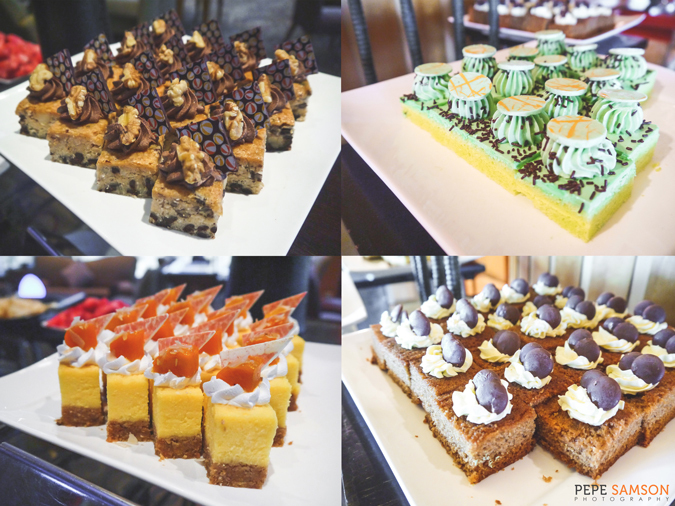 Read on to find out more of Pan Pacific Manila. 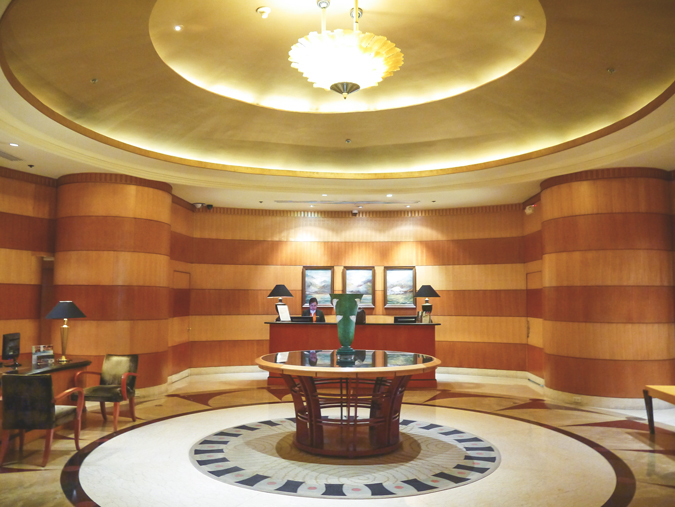 The moment I entered the striking lobby of Pan Pacific Manila, I already felt a sense of hominess. The butlers addressed me by my first name—“Mr. 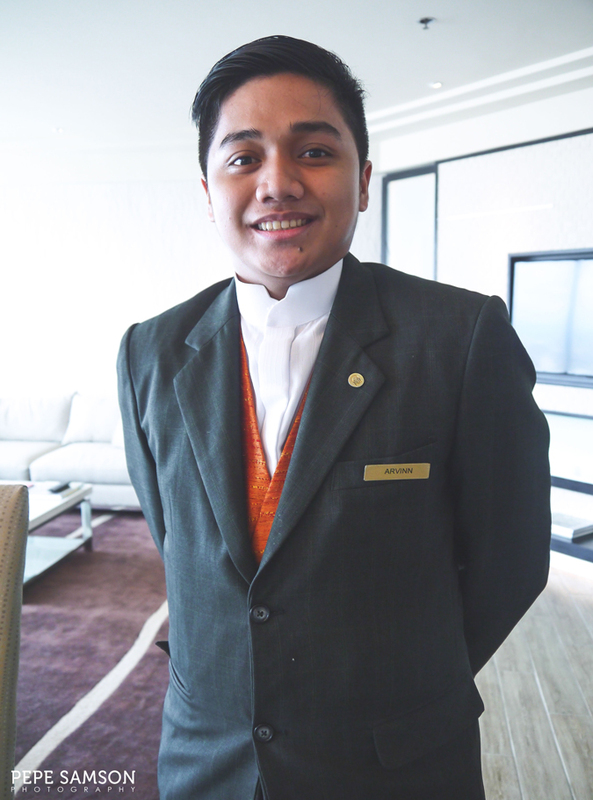 Patrick”, casual yet courteous—not just a mere “sir”. Checking in was quick, thanks to the efficient staff and system. 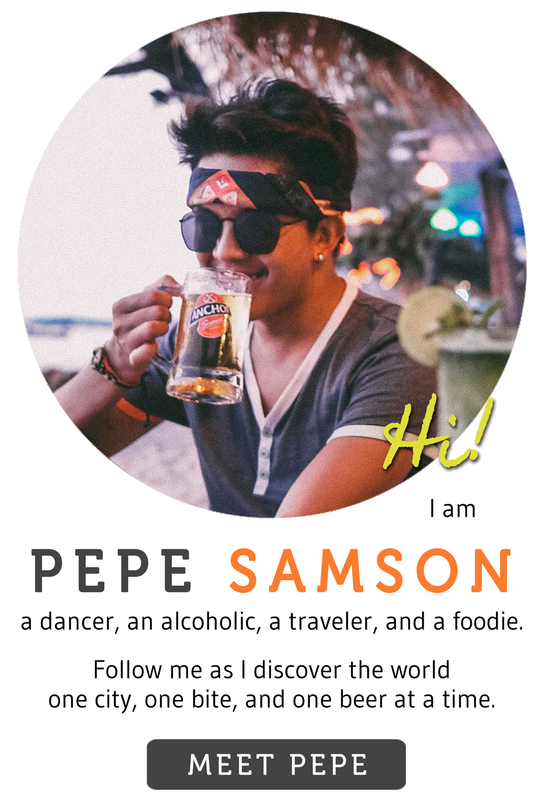 I had my secure key card in less than 10 minutes, was offered a welcome refreshment, and was assisted to my suite in the 18th floor. I loved the see-through glass walls of the elevator, which gave us nice views of the other floors, the pool in the 7th floor, and the Manila cityscape. 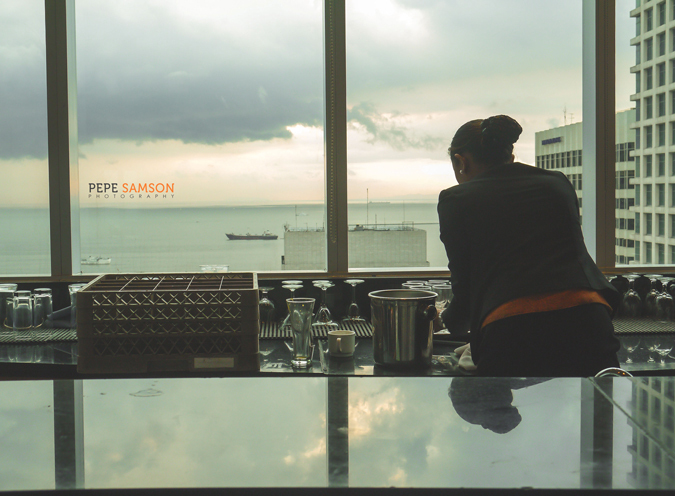 When the elevator doors opened, soft classical music filled my ears—a vibe that instantly relaxed. I hadn’t seen my room and yet I already knew my stay was going to be perfect. 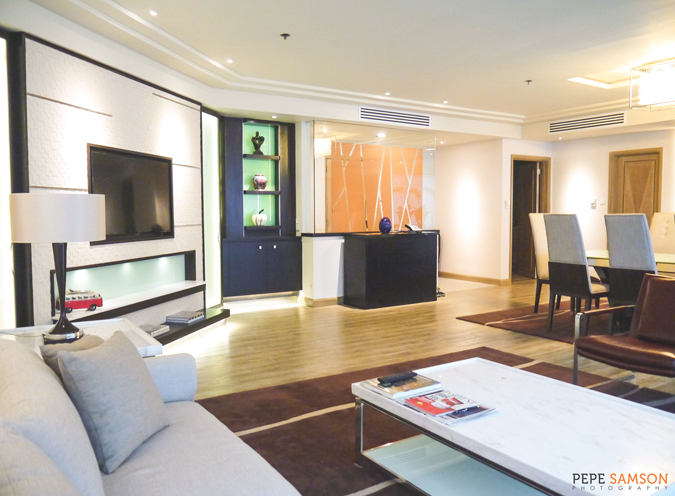 Pan Pacific Manila has 236 guest rooms and suites—ranging from Superior Rooms to Presidential Suites. 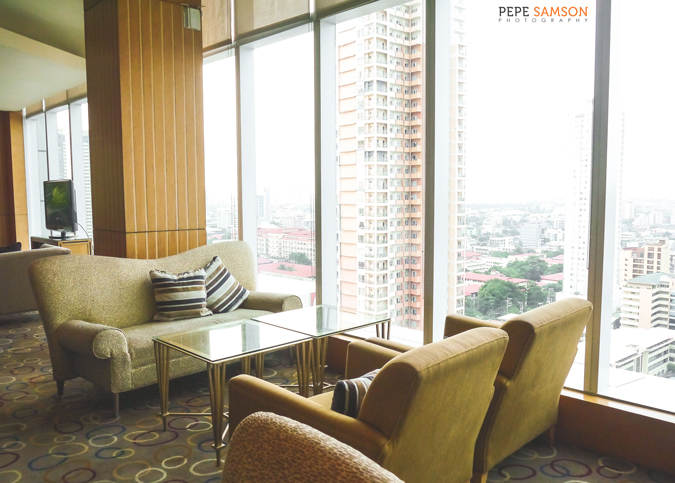 Some rooms offer a view of the Manila bay and the glorious sunset, while others showcase the bustling city life in Malate. No matter what category it is in, each room utilizes the best amenities, the most comfortable beds, and the most stunning views from floor-to-ceiling windows. 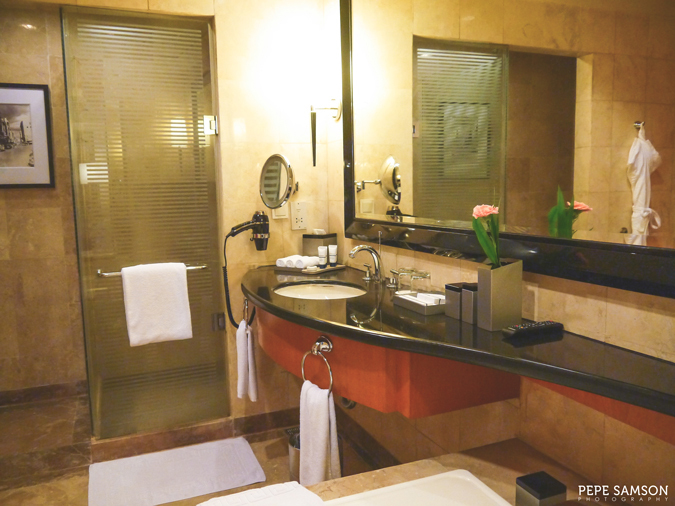 Every bathroom has a tub; every room, a workstation and a mini-bar; and every guest, a personal butler. 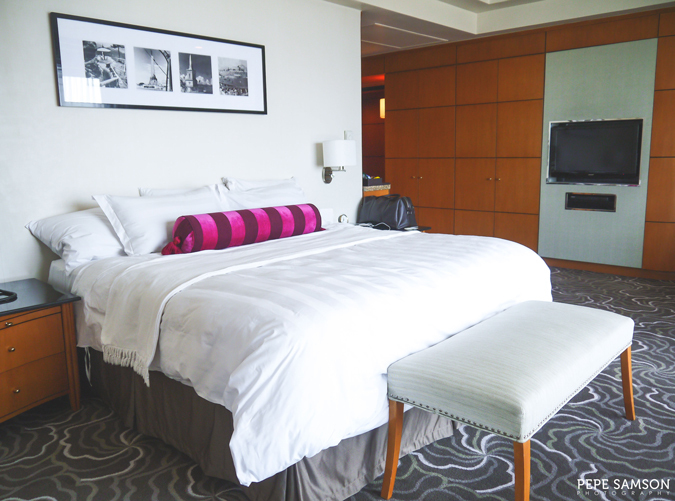 I was the ultimate lucky guy and got to stay in Pan Pacific Manila’s newly-updated Executive King Suite (PhP22,000++/night): a 126-sqm. fully-serviced suite that comes with a King-size bed; a separate bedroom; a spacious living and entertainment area; a dining area that resembles a conference room; a fully-equipped kitchenette; a luxurious en suite bathroom; a powder room; a fully-stocked mini-bar; and a workstation designed with the business traveler in mind. I was literally speechless for what seemed like an hour when I saw our suite—the second-highest category room at Pan Pacific. It was incredibly spacious, decorated in neutral color palettes with pops of red and green. The ornaments spoke of understated elegance, a perfect match for the dominant wooden furnishings. The electronic facilities add a touch of functionality and modernity. 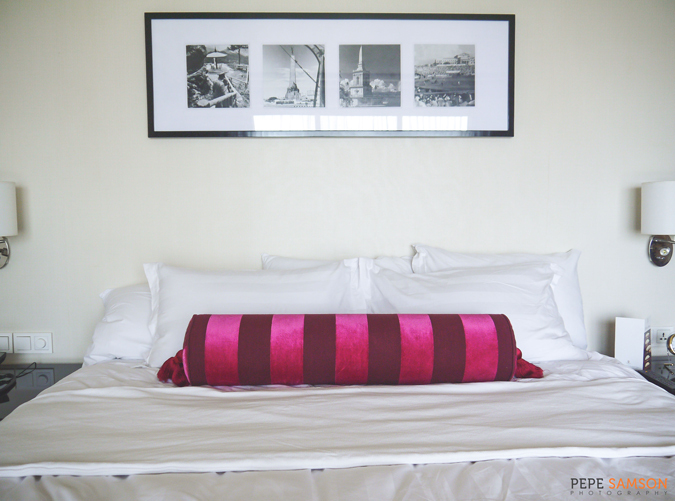 The bed is very soft and comfortable, with a duvet and a pillow menu. The en suite bathroom is luxurious, with a small TV installed right in front of the tub, a shower area that doubles as a sauna, a toilet with a bidet, and Embrace toiletries. 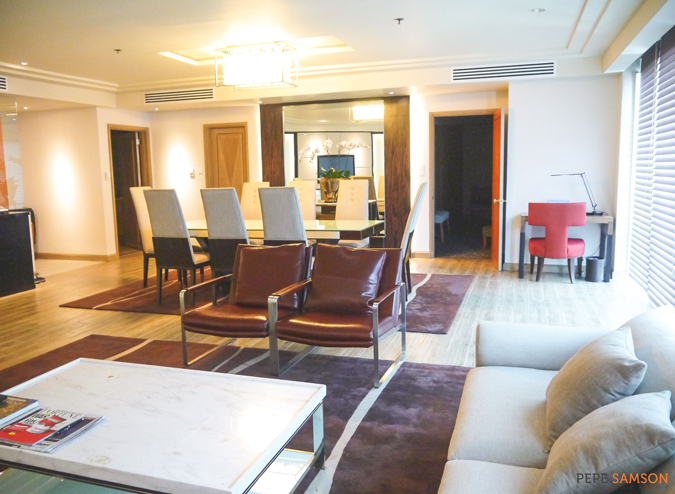 The living room features two full-size sofas perfect for inviting guests over, as well as two leather lounge chairs. A 32” LCD TV plays both local and cable channels. The dining area can accommodate 8 guests, while the kitchenette houses a stove, a refrigerator, a microwave, and complete utensils. The complimentary internet is fast and reliable, which business travelers would find delight in. 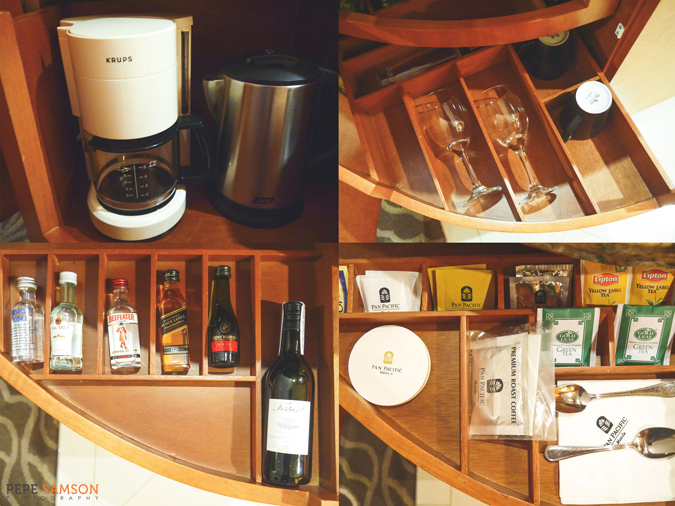 For nightcaps, guests can choose from the array of liquors and beers in the mini-bar. Tea and coffee making equipment are also available. 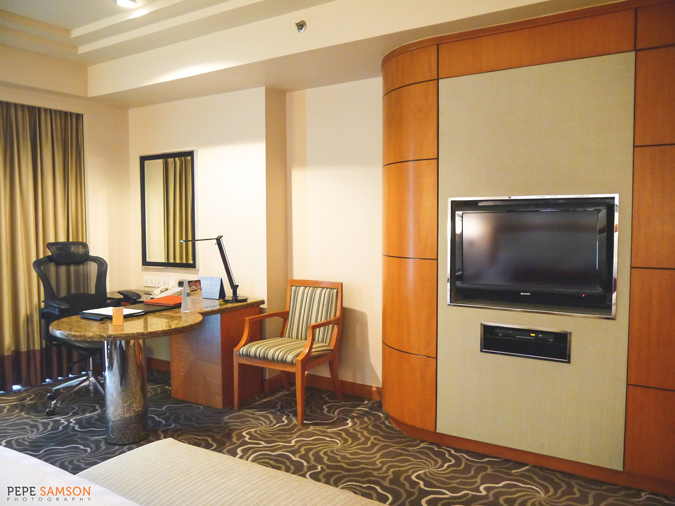 For a full review of the Executive King Suite, click here. 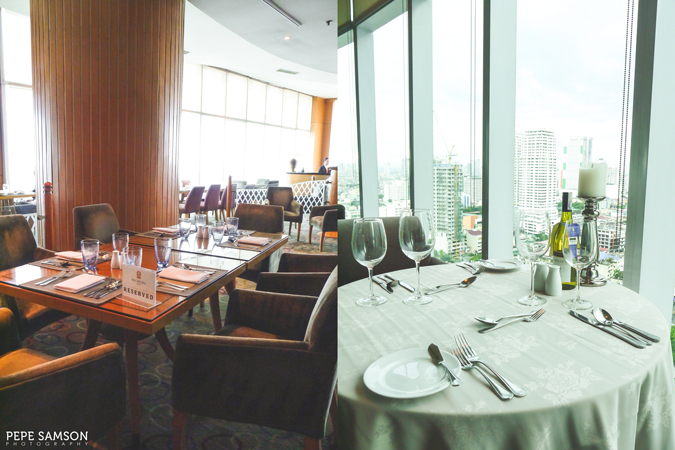 The Executive Room (PhP6,350++/night), while being in the second-lowest category, is far from being shabby. 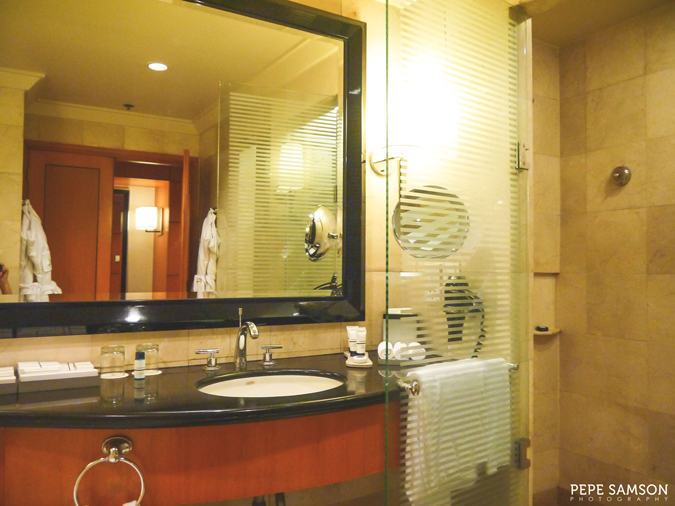 It enjoys the standard features of all Pan Pacific rooms I mentioned above, a 40 to 48-sqm. room with a King-sized bed, a workstation, a mini-bar, and an en suite bathroom. 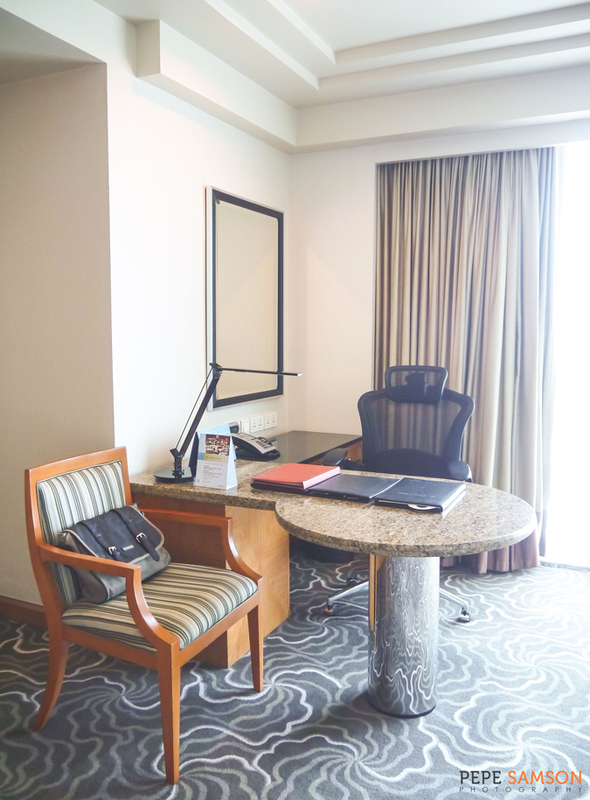 The work desk is similar to the one at the Executive King Suite, and the same TV is installed right in front of the bed, but what’s configured differently is the bathroom—which has a sliding-door window that peeks out into the bedroom. Instead of two sets of Embrace toiletries, the Executive Room only has one. 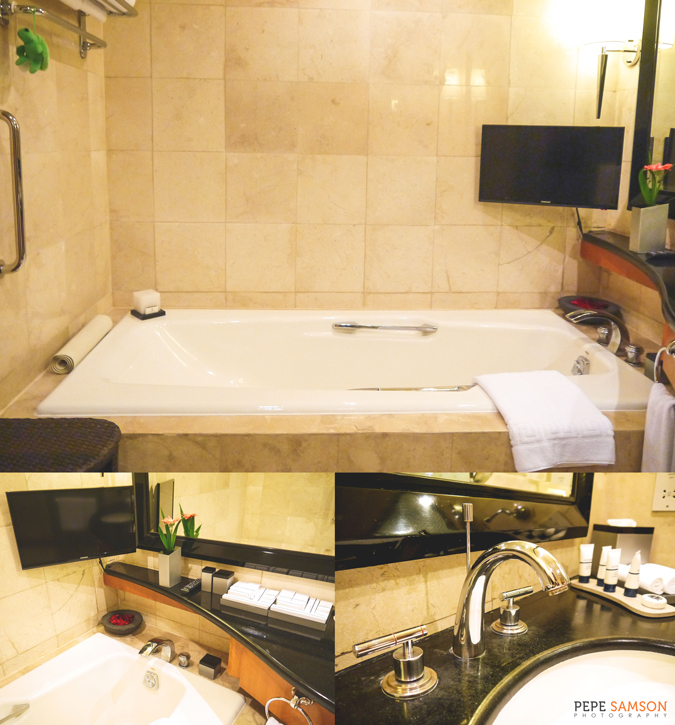 However, the same shower head and steam generators are here—and the tub has a small TV too. 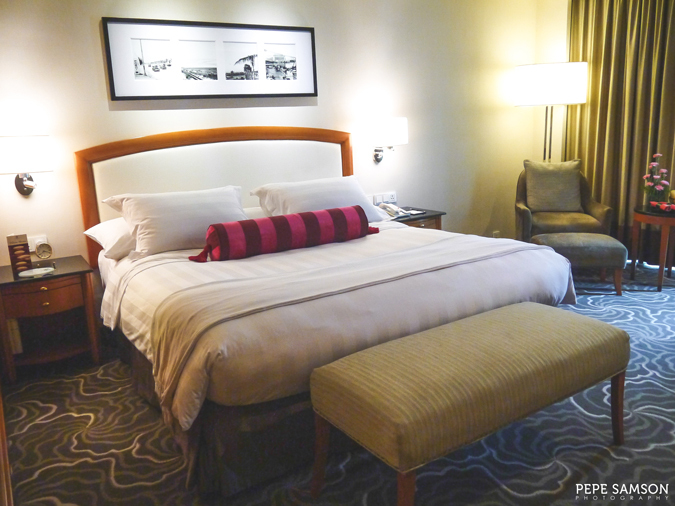 Considering the quality of the rooms, I would say that Pan Pacific Manila has a very low rate compared to the other five-star hotels in the metro. No wonder long-staying businessmen choose to stay here—a haven of luxury and value for money. 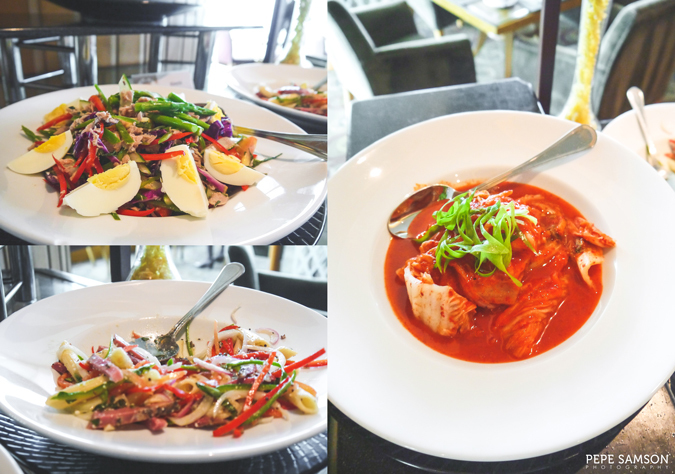 Pan Pacific Manila features three in-house dining and drinking venues: the Pacific Lounge, the Sunset Lounge, and the Lobby Lounge. 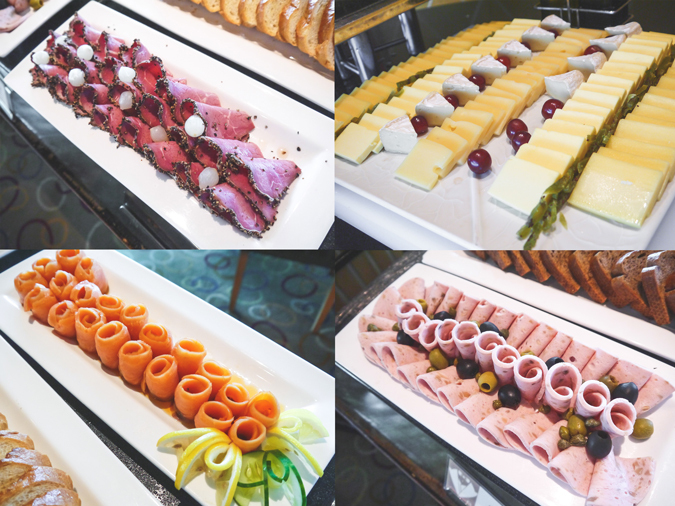 All three selections boast of unique concepts and offer a wide selection of international and local gourmet creations designed for every guest: from the simplest to the pickiest of eaters. 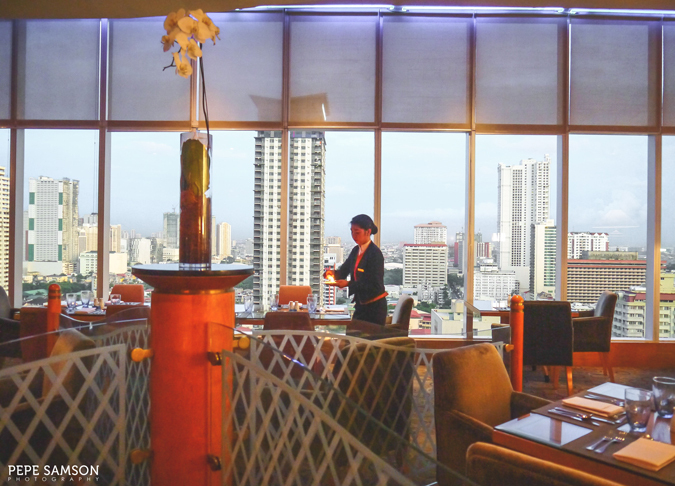 Situated on the 21st floor, the Pacific Lounge is an expansive and casual space offering sweeping views of Manila. 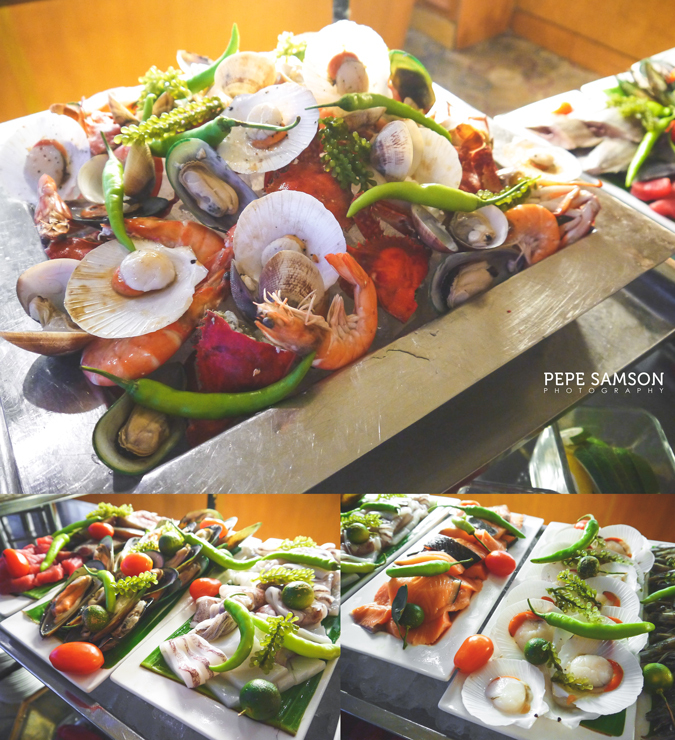 This is where the complimentary breakfast is served daily, and the restaurant also holds lunch buffets (Mon – Fri, 12:00NN – 1:30PM, PhP800++), dinner buffets (Thu – Sat, 6:00PM – 9:30PM, PhP1,100++) and pre-dinner cocktails (daily, 6:00PM – 8:00PM, PhP750++). 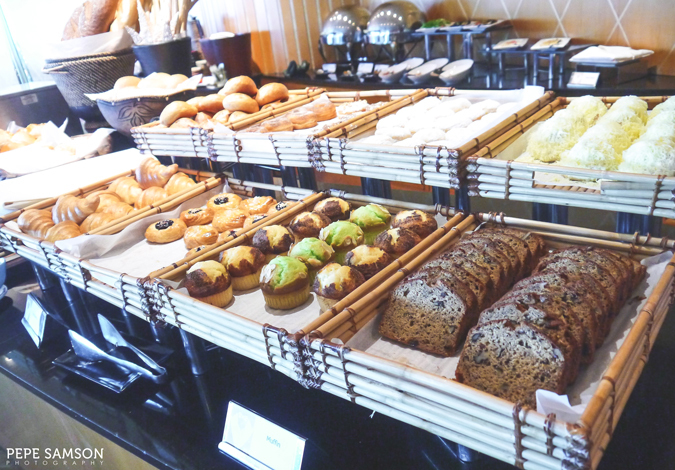 The breakfast spread is really good, featuring a humble but exquisite selection of Asian and Continental dishes. 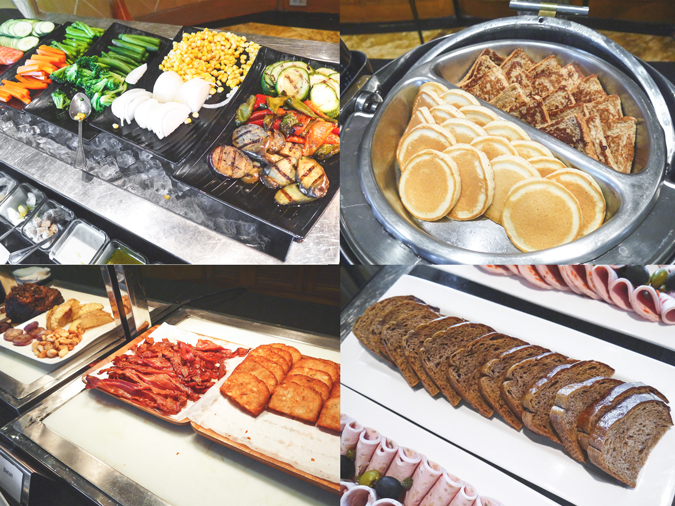 There’s a Japanese section with some sushi and miso soup; a cold cuts and salad section (where I lingered); a cheese section; a bread station; an American station, which features roast beef, pancakes, toast, hash browns, and bacon, to name a few; a Mediterranean station, which also offers Halal food; an omelet station; a cereal station; a beverage section; and a dessert section where you can choose from mini cakes and fresh fruits. 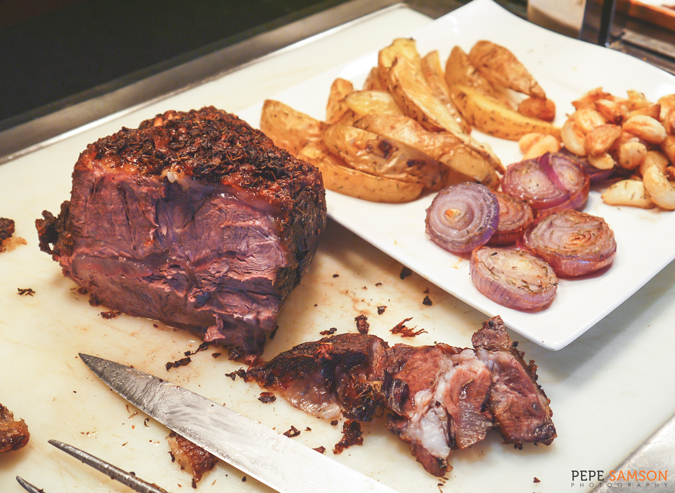 I enjoyed the pasta salads, the roast beef, the cheeses, and the cold cuts—which were delicious and fresh. 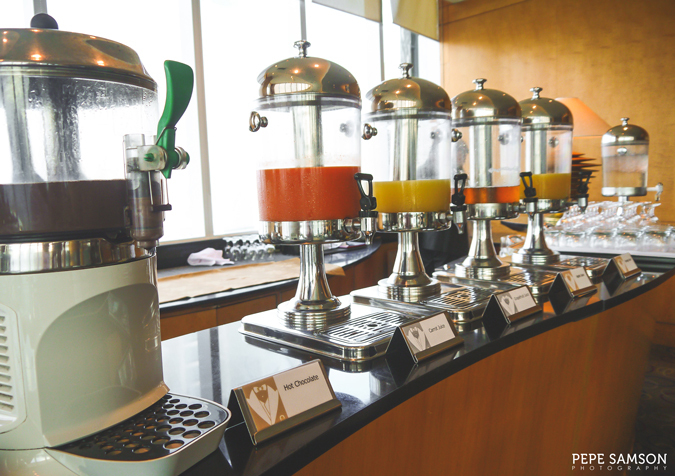 There’s an assortment of drinks to choose from—but my mornings are all about coffee. 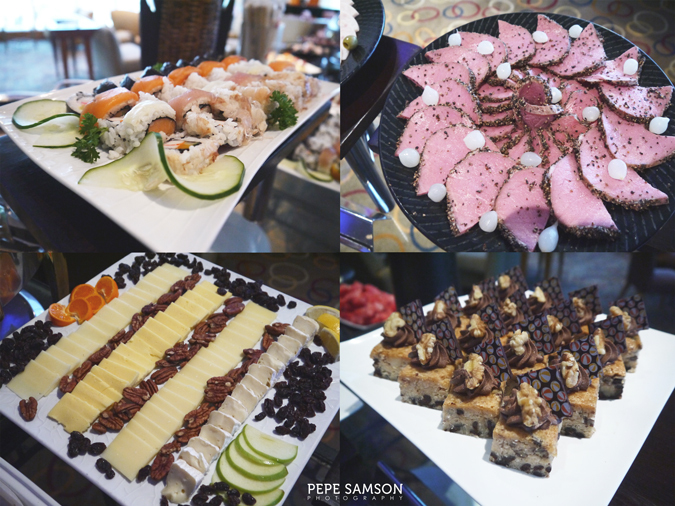 The pre-dinner cocktails spread features canapés, sushi, cold cuts, cheeses and cakes—as well as unlimited beer and cocktails, of course. This privilege is complimentary for all guests with suite categories (free for two guests). 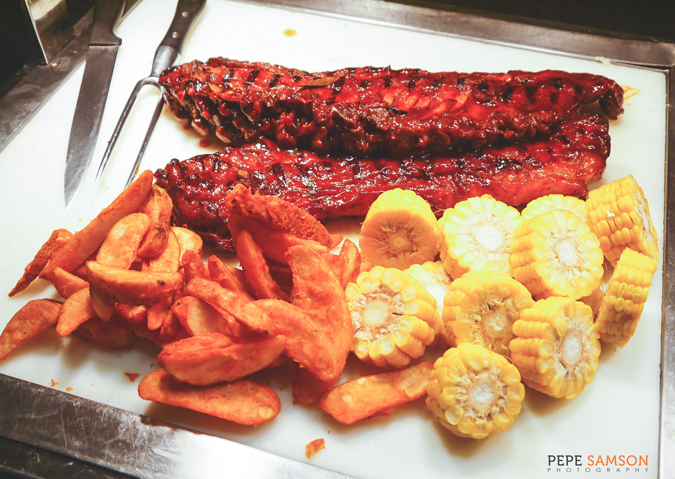 The dinner buffet, albeit compact, offers a mouthwatering selection of ribs and fresh seafood which guests can enjoy grilled. 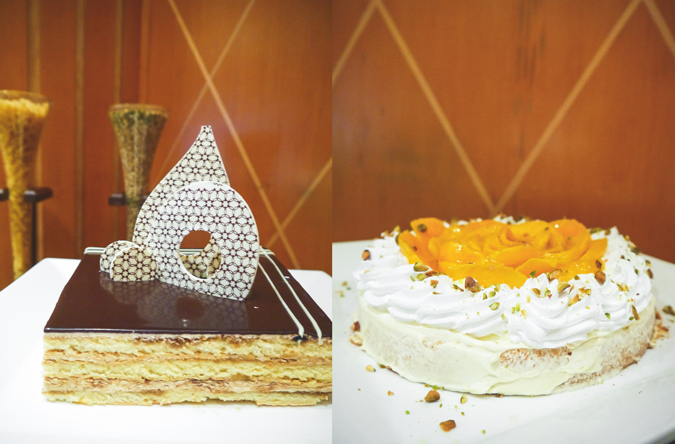 More specialty cakes are available for dinner. 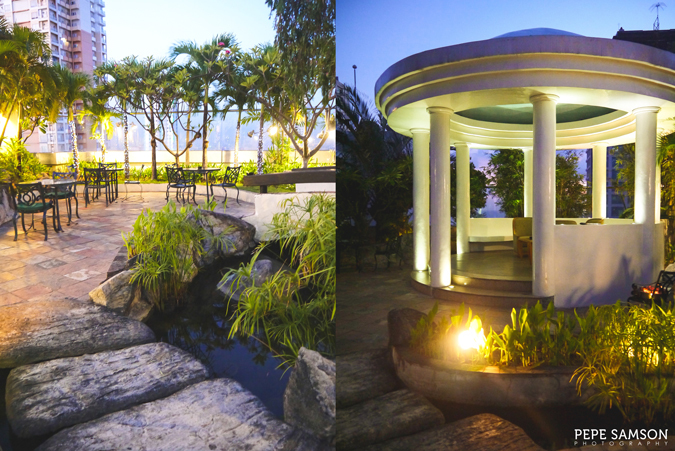 Apart from the stunning panoramic views, the lounge also has an adjacent al fresco area which has manicured gardens and a gazebo. 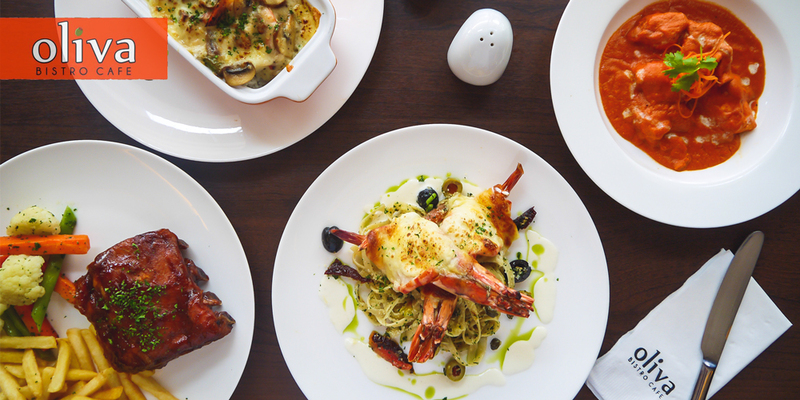 This is where guests can enjoy the Chef’s Talk Middle Eastern Menu—an Arabian feast paired with shisha. 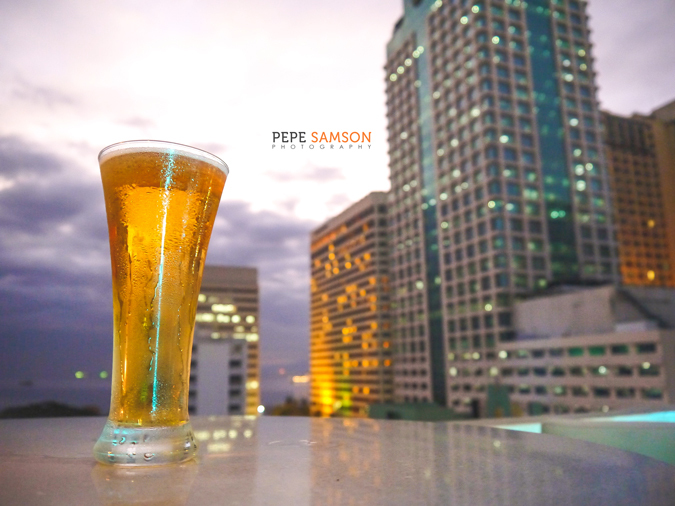 If you want a view of Manila bay while enjoying your ice-cold beer, head over to the Sunset Lounge at the 7th floor. The casual, chic set-up exudes the ultimate relaxation: lounge chairs and sofas near the pool and in front of the bay, where you can unwind with some drinks and pica-pica after a long day at work. 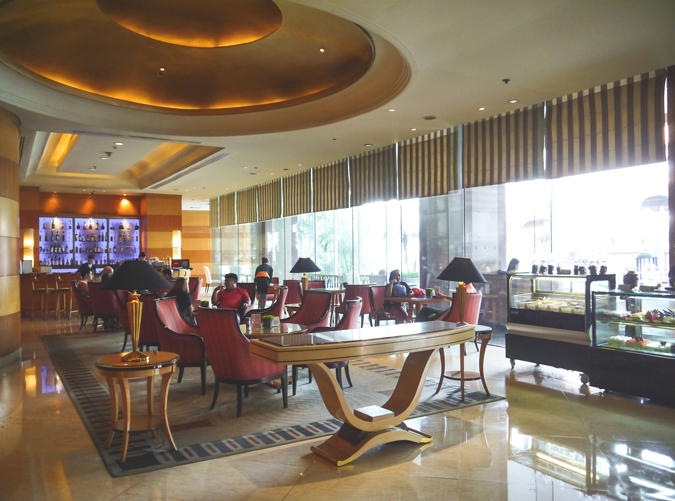 The Lobby Lounge, on the other hand, offers specialty cakes, tea, and coffee for the more laid-back guests of the hotel. 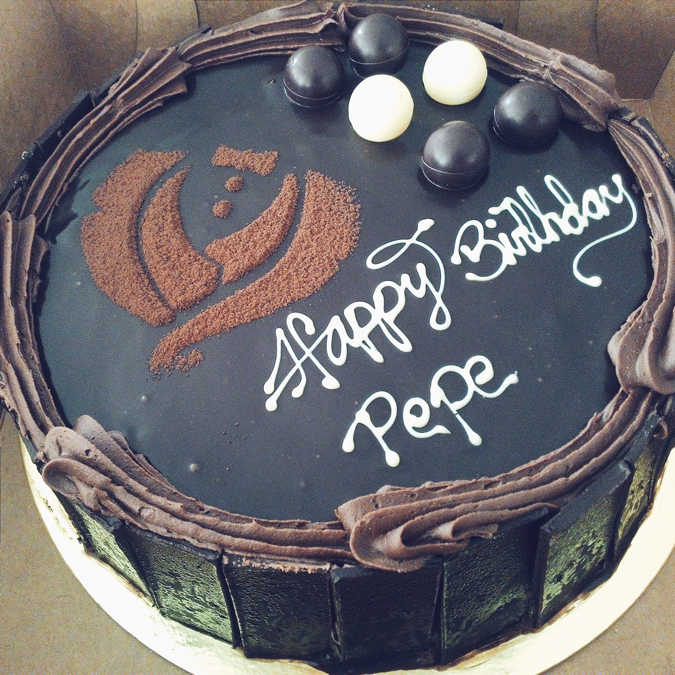 The famous Butler Cake is a must-try—a rich, decadent chocolate cake, which happened to be my birthday surprise from my friends from Pan Pacific last May! 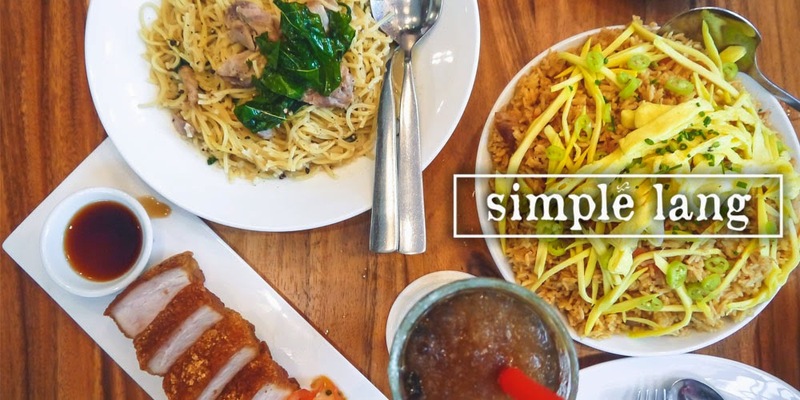 A five-star hotel should make you feel like everything you need is within reach—and this is true for Pan Pacific Manila. 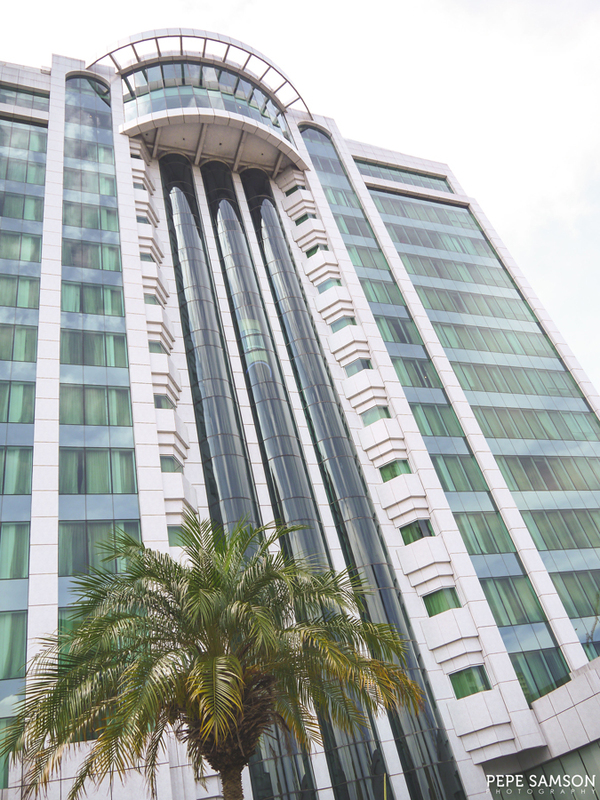 Naturally, being a business hotel, Pan Pacific has a Business Center which offers extensive services—from meeting room rentals, secretarial services, and equipment use to courier services, airline assistance, and express check-in and check-out. 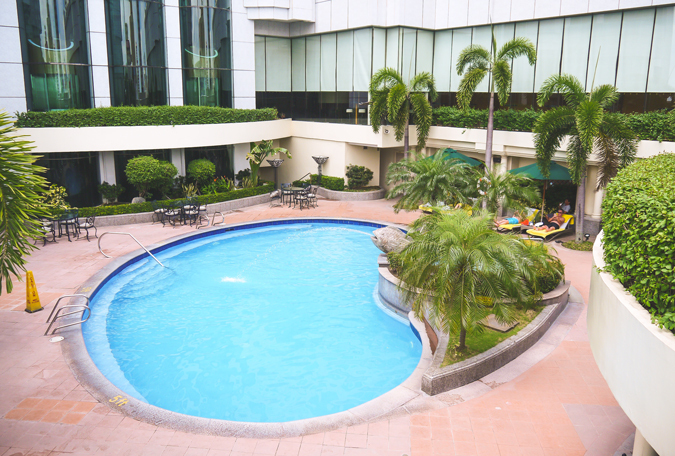 Guests aching for a relaxing time can enjoy the swimming pool located at the 7th floor outdoor area. 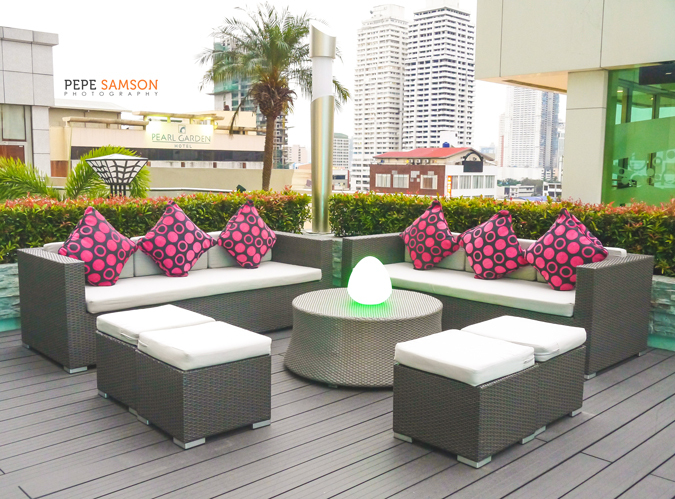 Lounge chairs are set up around the area, perfect for enjoying a few cocktails or small bites. 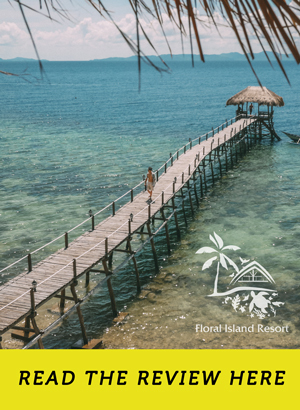 For extra pampering, guests can request for a massage at the sun deck and choose from spa treatments like reflexology, aromatherapy, Swedish massage, and Oriental Shiatsu massage. 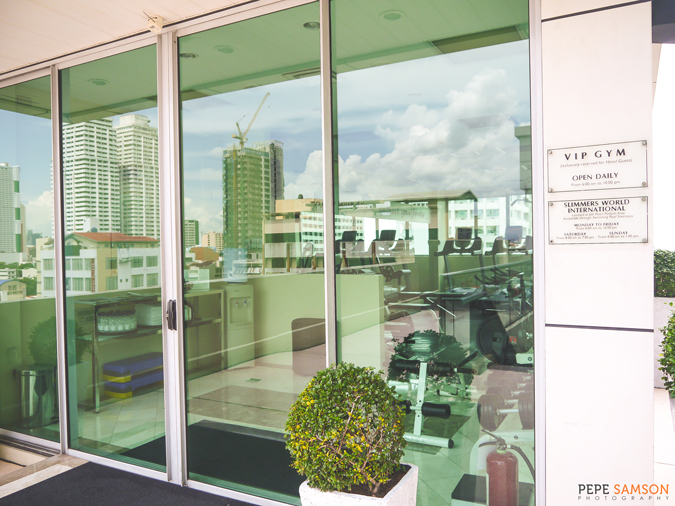 There’s a VIP Gym on the same area, for fitness junkies who can't get by a day without working out. 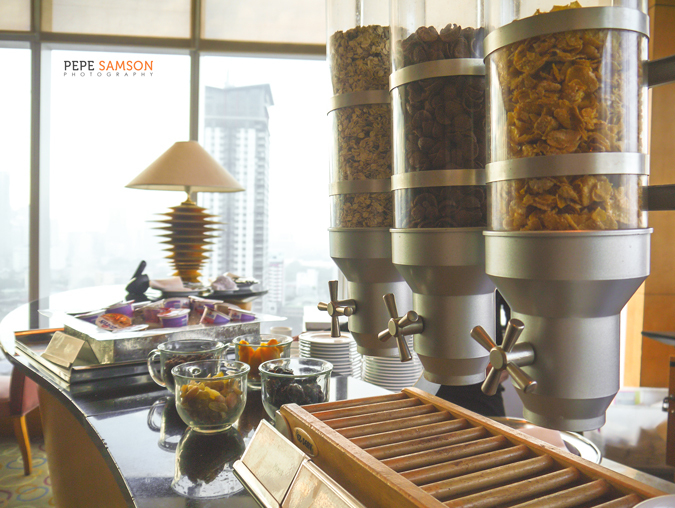 Checked-in guests of Pan Pacific also have special access to Slimmers World located downstairs. 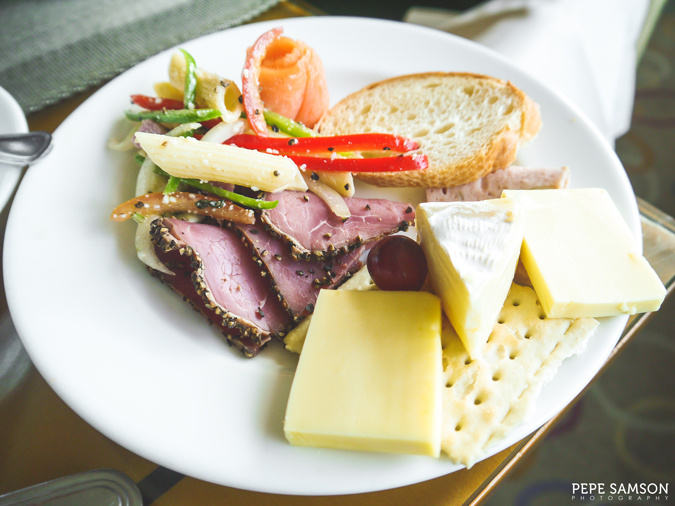 I can rave on and on about Pan Pacific’s rooms and facilities but taste is relative. 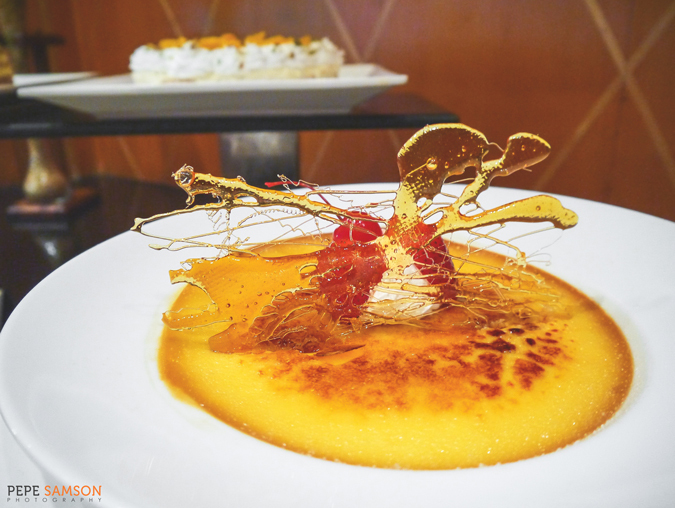 In the most meager chance that a guest might be unimpressed and unsatisfied with the hotel amenities, of this I’m sure: Pan Pacific has impeccable service, and guests can't help but feel the love. 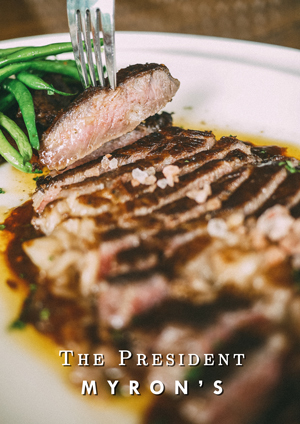 The butlers are professional yet casual and friendly—it’s as if they know who you are and how to treat you with a certain brand of personalized service. Personally, I don’t like stiff treatments in hotels, so I was so happy how my butlers during our stay were so composed and courteous while regarding me like they would a friend, and not just another hotel guest. I absolutely loved it! You can practically approach anyone and they would know the answer—or if not, quickly direct you to someone who does. 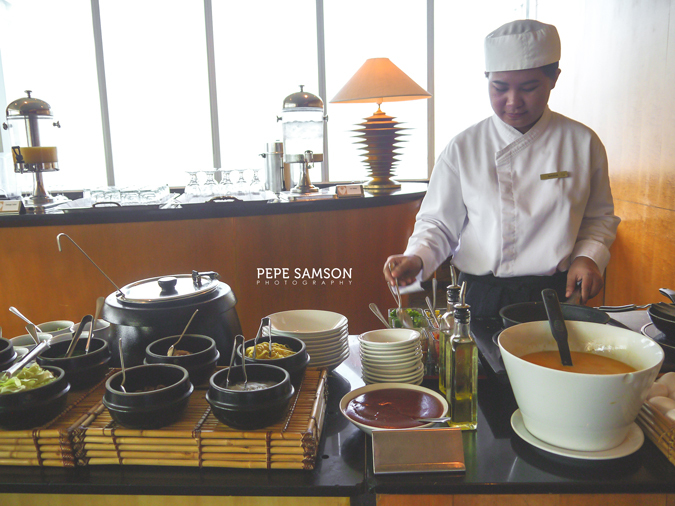 The chefs and housekeeping staff at the restaurants greeted me by first name, as if I were a regular guest they see every day. This is a personal touch I’ve never experienced anywhere else. 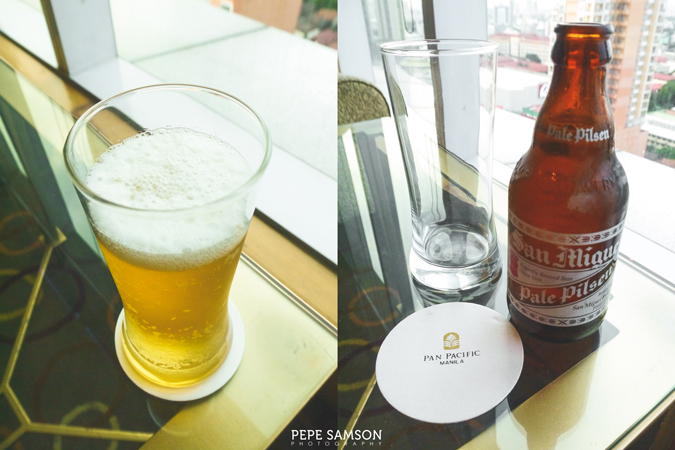 At Pan Pacific Manila, somehow it’s easy to forget that you’re in a five-star hotel because of the absence of snooty service. The staff treats you with such warmth and genuineness that you feel like home—or getting invited to somebody else's home, whichever memory gives you a fonder recall. And all the while, you are still aware of the luxury of it all. 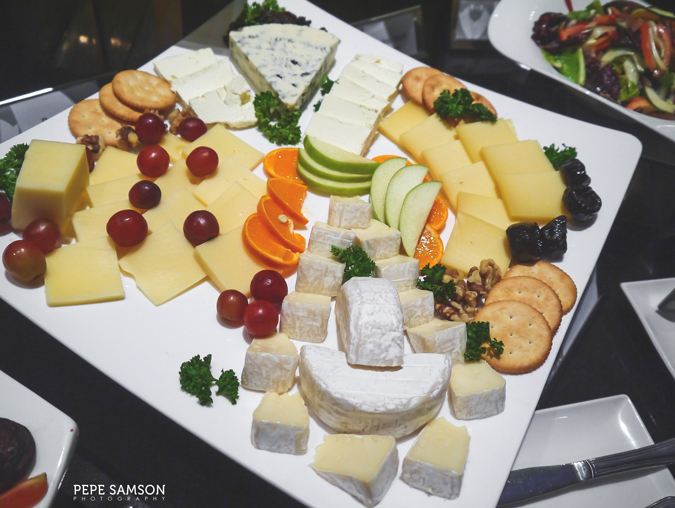 Pan Pacific Manila is proof that there's something regal about subtle luxury, and that sometimes, sincerity outshines every other aspect. 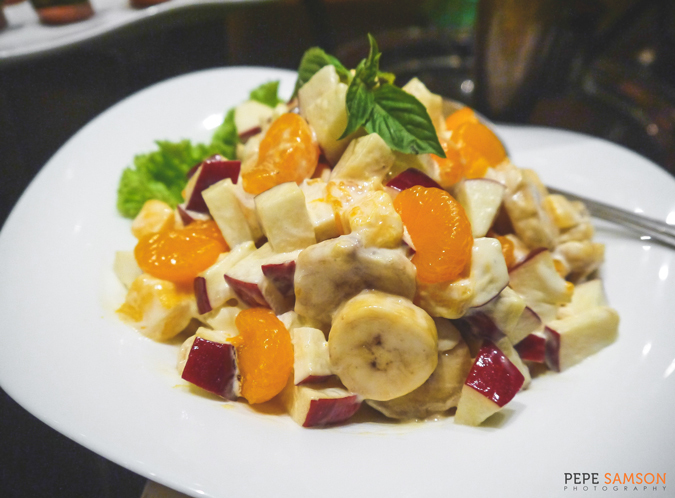 While other hotels boast of having the best of this and the best of that, Pan Pacific just kept its mouth shut and let you see it all for yourself. In fact, it makes you see it so clearly that you have no choice but to say it out loud for everyone else to hear. 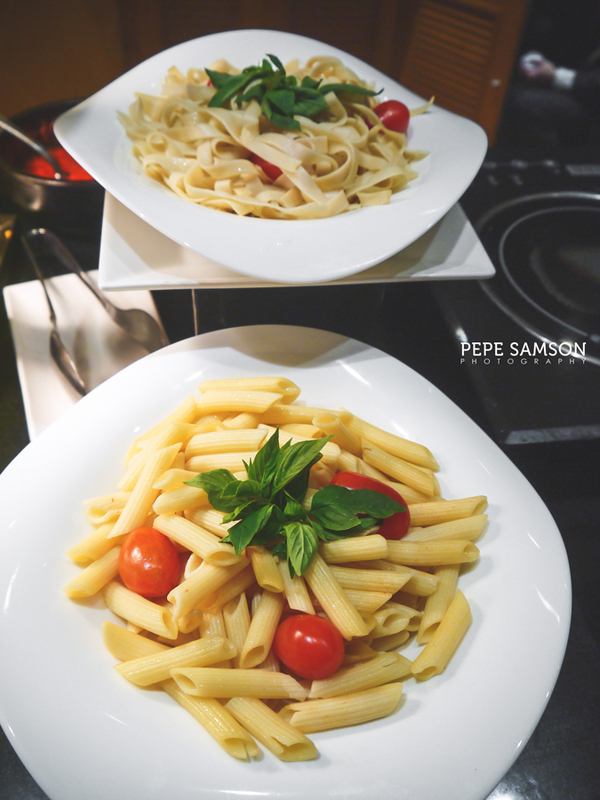 Rooms are well-maintained; beds are comfortable; hotel has everything you need. 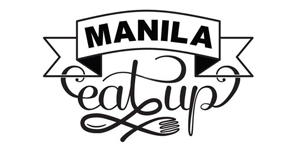 Service is top-notch; the best in Manila. 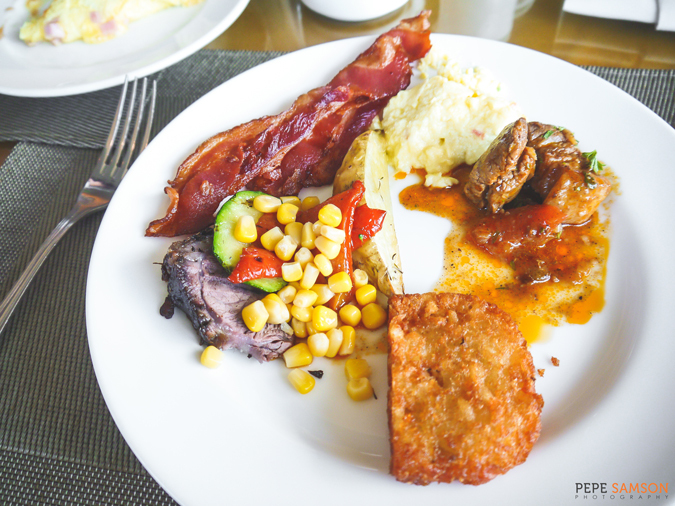 Breakfast buffet has really good selections; pre-dinner spread is good value for money. Hotel is quiet and unimposing. 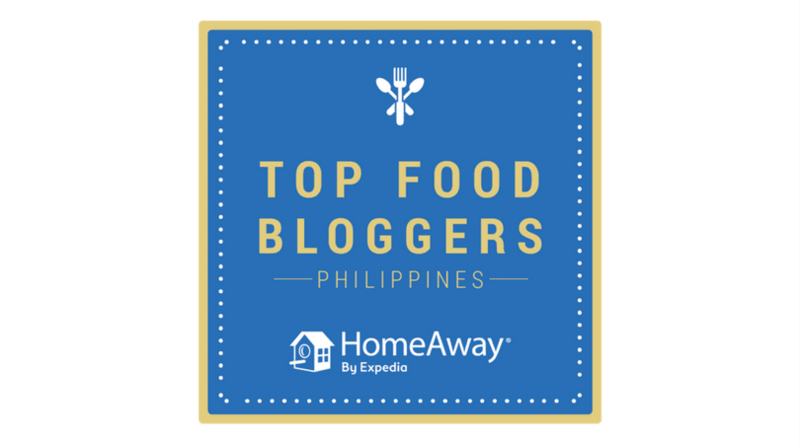 Near the business hubs and entertainment centers of Manila. A pleasant mix of vintage Manila and the modern city. 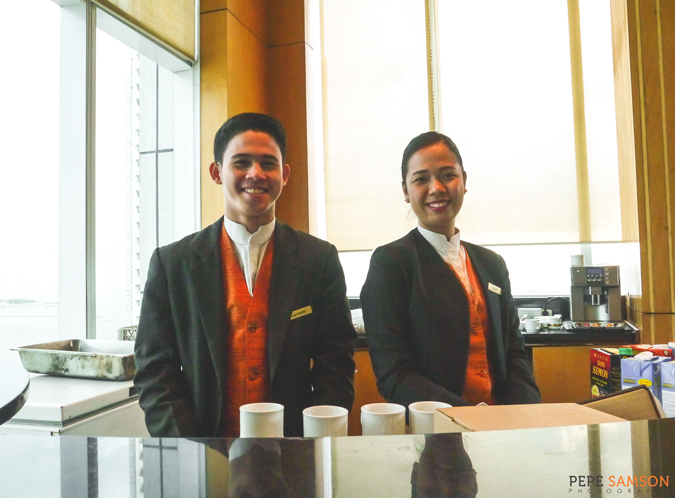 Have you stayed at Pan Pacific Manila? What did you think about it?